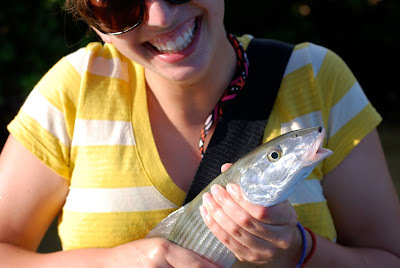 This River is Wild: Lex Takes Us To Bonefishing School. He’d flown out three days ago but was mentally still fishing the flats. 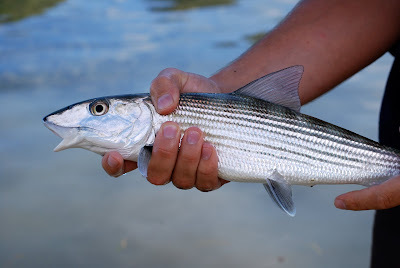 Mark’s only chance, having struck out with bonefish during his brief week of opportunity, was to live vicariously through us until he returned in 8 months. A few days after Stace and I had begun to settle into the school week routine and Lex settled into her own routine of napping her way through the beaches, I rigged up our 9wt for bones and the 10wt for baby tarpon and took Lex to our newly discovered honey hole. The goal was to give her a chance to cast to some fish. This was unrealistic for a few reasons. More often than not, I see nothing during a trip to the flats. Not a sign. 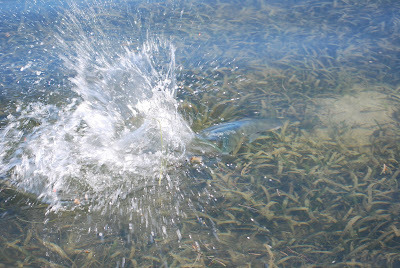 Of the remaining encounters, there is probably only a viable shot at a bonefish 10% of the time. 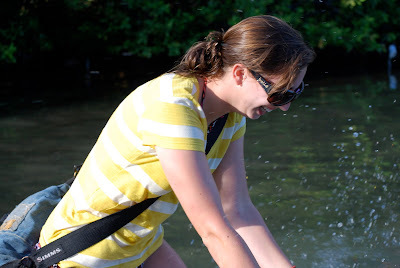 As I have previously documented, bonefishing is difficult. Furthermore, Lex had received her first saltwater lesson about a week ago. So, it was with these expectations that we slunk through mangrove roots and entered the water with about an hour of sunlight left. I helped Lex set herself up for a quick cast and gave her a 3 second tutorial on how to walk on the flats. Shuffle your feet slowly, watch out for rays, scan at the limits of your vision and look for movement. Astoundingly, as I finished that lesson, I caught movement above the turtle grass not 10ft in front of me. Realizing it was a pod of bones, more bones than I had ever seen in one place, I ducked low and rasped to Lex a command to throw her fly 8ft to my 12 o’clock. Lex was 5ft to my left and she was casting right-handed. Her first cast was not to hit it’s mark. The leader wrapped about my torso and the fly caught my shorts. I unhooked while barely moving and pulled as much of her fly line through her guides as she would need to get the fly into position. We were both laughing. Her 2nd cast wrapped around my neck but thankfully didn’t hook me in the face. She pulled the rod tip up in an attempt to untangle and only looped the line around the rod a few dozen times. Thinking all hope was lost, I dared look for the bones. Incredibly, they had moved closer to me. At least a dozen fish were no more than 6ft away, hovering above the turtle grass in 18inches of water. We managed to untangle her rig without spooking them. Her next cast landed 3ft in front of me and I watched, incredulously, as two bonefish zoomed over to inspect the slowly sinking shrimp pattern. One of them moved right on top of it, and paused. “What does that mean? !” she replied. “Strip! Lift! Pull!” I was freaking out. This was just too much. She managed to take in some slack line and felt the fish. The bone took off, peeling out a bit of line, but Lex had a death grip on the fly line and wasn’t letting it take any. “Let her run! Just let her run! Keep the rod tip up!” I barked commands as Lex giggled uncontrollably. With about 20ft of slack line sitting on the water, the bone just cruised around, more confused than alarmed. When I caught my breath from laughing, I told her to take in the slack and keep the line taught. At this, the fish thrashed and peeled out some line. It was no match for Lex’s superior play. She guided the bone towards me and I scooped it up. 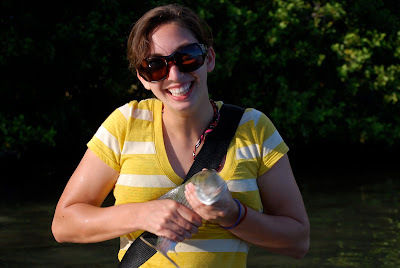 In countless hours of fishing the flats of this island, my sister lands the first bonefish in ridiculous fashion. How embarrassing for that poor bonefish. The fish finally realizing it was hooked. About to facilitate the release and she doesn't even know it. That's my girl! Sometimes it just takes a woman! hahahahha it was quite an almost-debacle! That first picture is awesome... What a gorgeous fish. haha! She'll never let you live this one down!